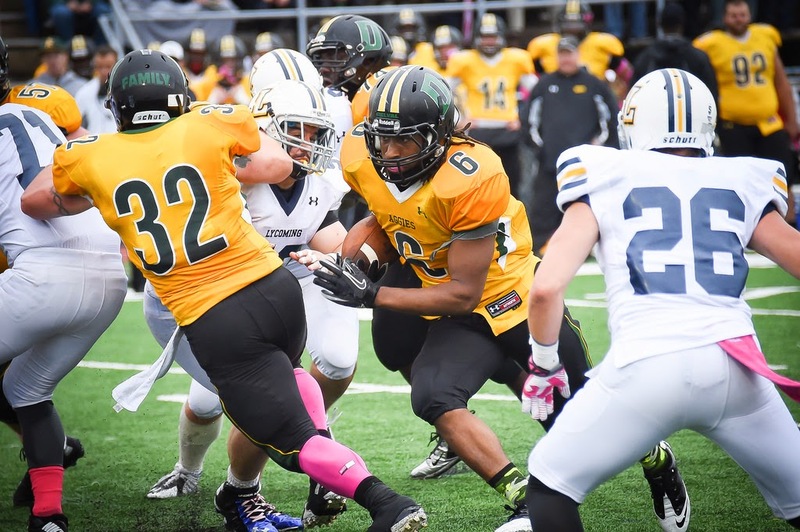 ANNVILLE (PA) – Delaware Valley College senior tailback Chris Smallwood (Philadelphia, PA/Upper Moreland) was named to the Middle Atlantic Conference (MAC) Honor Roll for his performance in the Aggies’ 24-21 road triumph over conference foe King’s College on November 1. The honor marks the third time this season that Smallwood has been recognized by the conference as he was voted Offensive Player of the Week in week one and named to the Honor Roll in week six. In Saturday’s contest, Smallwood ran for 169 yards and a score on 30 carries as well as two catches for 13 yards. The touchdown was his 18th of the season, tying the school’s single-season record with at least two more games to play. It also moved him into third nationally in rushing touchdowns and fifth in all of Division III in scoring with 13.5 points per game. Smallwood has rushed for 1,090 yards this season and 136.2 yard per contest, both of which rank him 11th among all backs in the country. In addition, he has caught 20 passes out of the backfield for 206 yards. Delaware Valley will look to remain undefeated as it hosts FDU-Florham this Saturday, November 8, for a 1:00 p.m. kickoff.